Hungarian-American violist Anna Pelczer has become a sought-after guest orchestral leader both in Germany and abroad. Recent performances have been with the Beethoven Orchester Bonn, the Philharmonie Baden-Baden, the Staatsorchester Mainz, and the English National Ballet, among others. A frequent collaborator for contemporary works, she is a member of the Lucerne Festival Alumni and recently premiered several new works by Kaija Saariaho. In November 2018, she premiered a new commission from Yoshiaki Onishi at the International Viola Conference in Rotterdam, Netherlands. An active teacher, Ms. Pelczer maintains a private studio and has served as a coach at the Verbier Festival Amateur Chamber Music Week in Switzerland. 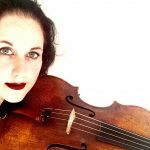 She is currently Professor of Viola and Chamber Music at the European Summer Music Academy in Kosovo, and has been a part of the teaching faculty at the Goppisberger Musik Wochen in Grächen, Switzerland since July 2014. Anna Pelczer attended Yale University and the Yale School of Music, where she studied with and served as teaching assistant to Jesse Levine. She has participated in masterclasses with Zoltán Tóth, Bruno Pasquier, and Rainer Moog. A former Fellow with the New World Symphony, she attended the International Ensemble Modern Academy, the Festival Pablo Casals, and performed as principal viola at the Verbier, Schleswig-Holstein, Luzern, and Tanglewood Music Festivals. Ms. Pelczer lives in Karlsruhe, Germany, and performs on a viola made in 2011 by Ersen Aycan.